Stellar Planet: Can Gas Giants turn into rocky planets? Not only can this happen but we have been able to watch it in action. There is a complex interplay between close-in giant planets, commonly known as Hot Jupiters, and their star. Due to their proximity and mass their gravitational pull has a more pronounced effect; this can raise tides on the star, like those caused on the Earth by the moon, and can cause mass to be lost from the planets’ atmosphere. The tides gradually draw the planets closer in towards the star changing the planets orbit; this process is called tidal migration. However, the closer the planet gets to the star the hotter the atmosphere will get, and more mass is ‘cooked’ off the atmosphere. This loss in mass in turn reduces the effect of tidal migration and slows the rate of orbital change. It is thought that this give and take process is what produced the Hot Jupiters we are observing today. One of the most observed Hot Jupiters is HD 189733b, and in 2011 a team of astronomers lead by Alain Lecavelier des Etangs (CNRS-UPMC, France) observed this process in action. HD 189733b is similar to Jupiter but orbits its star 13 times closer than the Earth does the Sun. Even though the star is slightly smaller and cooler than the sun it is very active meaning that the planet is regularly battered by stellar radiation in the form of extreme-UV and X-rays. Despite this, the planet’s atmosphere is not hot enough to evaporate at a hugely visible rate over small time periods. The first sets of observations, using Hubble, were taken in 2010 showed this and no evaporation was detected. However, it was not until the team got the results from the follow up observations in 2011 that they saw a change. The second set of Hubble observations showed clear signs that a plume of gas was being blown from the atmosphere trailing the planet. As luck would have it there was another satellite aimed at HD 189733 that day, the Swift X-ray satellite, which detected a powerful flash of radiation coming from the surface of the star a few hours before the Hubble observations started. The X-rays are energetic enough to heat the gas in the upper atmosphere to tens of thousands of degrees, hot enough to escape the gravitational pull of the planet. More simultaneous observations will be needed in the future to confirm the relationship between the two events and get an in depth view at the complex relationship between the stellar activity and the planets’ atmosphere (2). However, confidence is growing in the theory of atmospheric evaporation with these latest results give us a visible time scale as to the process. On the other end of the scale there is some evidence that atmospheric evaporation and tidal migration can cause a planet to lose its entire atmosphere. 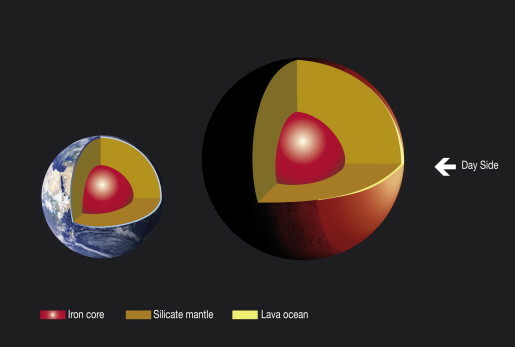 In February 2009 a planet called Corot-7b was discovered, its radius is 1.52 times that of the Earth and is over nine times as massive, indicating that it is made up of rocky material. Corot-7b however, is nearly 60 times closer to its star than we are to the Sun meaning that on the dayside temperatures could reach up to 2000°c. Accounting for tidal migration and the heating of the atmosphere simulations show that Corot-7b could once have been as massive as Saturn and orbiting 50 times further out than it is now (1). 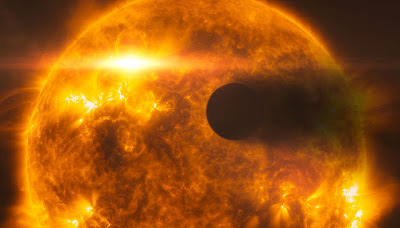 Corot-7b was the first in a new class of planets known as “remnant cores” and since its discovery others have been found to have had similar fates.